Cheryl Chestnut (left) and Kathryn Foster from Calloway County High School will travel to the USA Games with Team Kentucky for the Youth Leadership Experience. When the Team Kentucky planes depart for Seattle and the 2018 USA Games on June 30, it won’t just be athletes and coaches making the trip. Special Olympics athlete Cheryl Chestnut and Unified partner Kathryn Foster of Calloway County High School will be attending the Games as Kentucky’s ambassadors to the Special Olympics Youth Leadership Experience. The Youth Leadership Experience provides a way for one Unified pair from each state to attend the games not to compete in a sport, but to experience a different perspective of the games. Through this experience we will be able to work with Young Athletes, have fun with fans, gain practice with social media platforms, and even shadow coaches and staff of Special Olympics. Cheryl has been a Special Olympics athlete for four years, competing in bowling, golf, basketball and soccer. Kathryn has been involved in Special Olympics activities for three years as a Unified Club member, Unified partner, an event volunteer, fundraiser and fan. They both compete on the Calloway County High School Unified track team. Recently the pair took part in the Team Kentucky training camp that was held in Lexington to help prepare the team for the trip to Seattle. They visited each team’s practice, spoke to athletes about what they were looking forward to at the Games and photographed much of the camp to create a photo book. Both Cheryl and Kathryn are looking forward to their USA Games experiences. “I want to gain experience at learning leadership skills and gain knowledge and experience about being involved in Special Olympics other than in competition,” Cheryl said. “My goal throughout this opportunity is to see the different parts of the event and to get a better understanding of what jobs there are within Special Olympics,” Kathryn added. 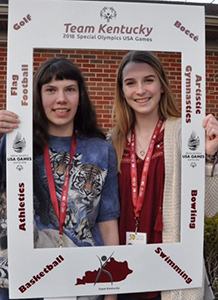 Cheryl and Kathryn are the latest Kentucky students to have the opportunity to make a Unified experience trip around a USA or World Games. In 2014, athlete Tori Cobb and Unified partner partner Madison Cohoon of Calloway neighbor Murray High School attended the National Youth Summit at the USA Games in New Jersey. Last year, Cobb and Murray’s Lindsay Wagner were selected to go to Austria for the Global Impact Summit that was held in conjunction with the World Winter Games. Calloway County High School was an early adopter of Unified Champion Schools programs in Kentucky. The Unified Champion Schools program helps schools fight bullying and build safer, more inclusive school communities through activities that include Unified sports, clubs and school activities. For more information about the Youth Leadership Experience or about the Unified Champion Schools program, contact Karen Michalak-Parsley, Unified Champion Schools and Competition Manager, at 502-326-5002 or kparsley@soky.org.